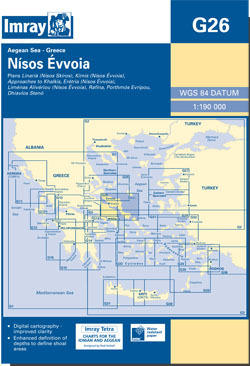 Show most of Evvoia (Euboea) and the crossing to Skiros. Scale: 1 : 184,600. Larger scale plans of Approaches to Chalkis, Linaria, Kimis, Eretria, Limenas Aliveriou, Rafina, Dhiavlos Steno and Porthmos Evripou.